A team of Thistle Windows & Conservatories staff, friends and family recently took part in the CLAN Landmark Walk – a sponsored walk for local cancer support charity CLAN, to raise awareness, funds and mark 30 years of cancer support across North East Scotland, Moray, Orkney and Shetland. Setting off from Aberdeen’s Westburn Park on a sunny Sunday morning at 11am, the team covered a route of approx. 13 miles (21km), taking in 30 landmarks around Aberdeen. The weather couldn’t have been better for the event with the sun shining down relentlessly, making for some stunning views of the town. The support and motivation of the many CLAN volunteers was amazing and the water & snack stations stationed along the route were much appreciated in the heat of the day! Everyone from Team Thistle who took part managed to complete the entire route, although there were a few sore feet and aching legs once everyone had passed the finish line – thankfully Thistle Managing Director Ian Bruce came to the rescue with emergency Ice Creams which were sorely needed! 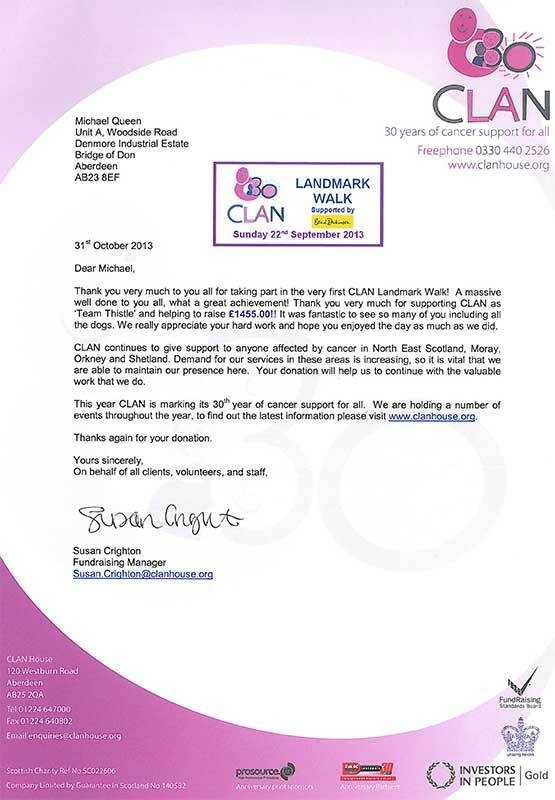 The team from Thistle Windows and Conservatoriesmanaged to raise over £1400 through sponsorship of the CLAN Landmark Walk a really great achievement and well worth everyone’s efforts (and aches and pains!). Many thanks to Ian, Allison, Gemma, Chelsea, Marion, Amie, Eilidh, Kieran, Tracy, Karli, Emily, Chris and Michael who represented Thistle Windows and took part in the event. A very special thanks also goes out to Maddie and Tula, the Thistle Windows pups who kept everyone smiling and motivated throughout the day. They weren’t too keen on Clancy The Rabbit, CLAN’s mascot, but they thoroughly enjoyed the walk too and enjoyed some well deserved rest afterwards!